Are you looking for a simple, robust frequency inverter? Our MOVITRAC® LTE-B with IP66 degree of protection is ready for field use. Ideal for tasks in small, modular conveyor lines, in fans and pumps - all without the need for a control cabinet! The MOVITRAC® LTE-B field housing with IP66/NEMA 4x protection is ideal for use in harsh environments. The frequency inverters from this series enable simple operation and user-friendly functions for open-loop speed control of asynchronous motors. Matches your requirements: The 3 sizes of the MOVITRAC® LTE-B for power ranges from 0.37 kW to 7.5 kW and line voltages of 115 V, 230 V and 400 V.
MOVITRAC® LTE-B in IP66 quickly and economically solves simple conveyor applications. For instance, in small, modular conveyor lines and in fans and pumps. With an extra-quiet pulsed voltage supply up to 16 kHz, it is ideal for use at manual workstations. Parameterization is even simpler thanks to the integrated control plate. Of course, a control cabinet version of the MOVITRAC® LTE-B basic inverter is also available. The MOVITRAC® LTE-B can also be expanded with an optional external control plate. These frequency inverters communicate with the DFx gateways via all commercially available fieldbuses. 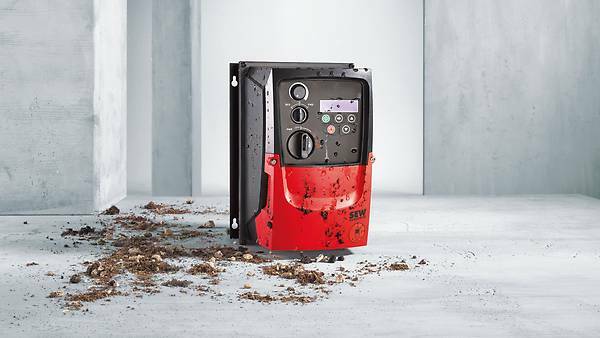 thanks to the user-friendly inverter handling: simple task – fast solution. for field operation. MOVITRAC® LTE-B in IP66 for installation outside of the control cabinet. Field installation for conveyor applications, e.g.